I was pleasantly surprised when we were served peppermint and lemon grass tea at Caffe Ti-Amo during their store blessing today. The store manager brought us this cool looking device and explained that they would steep fresh tea leaves in it. You just need to place hot water, the tea leaves and wait 15 minutes. When it's ready just put it on the cup and it will automatically transfer the tea sans the leaves. I tried out the peppermint tea and I almost finished off the whole cup since it was really good. One order is about PhP100 (huge serving!). 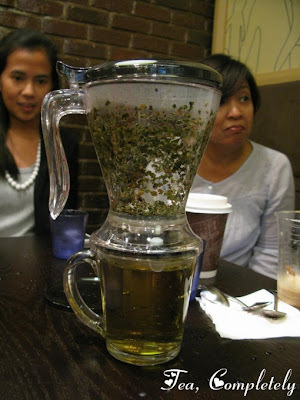 And they also sell the tea gadget for about PhP2K. You may want to read more about Caffe Ti-amo. I wrote about their yummy Italian gelato in Lakwatsera Ako. 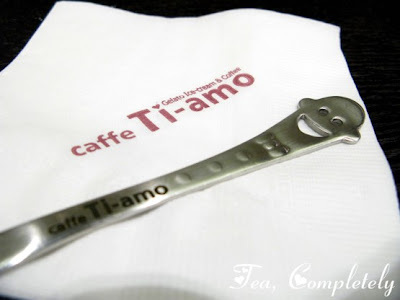 I just chanced upon your cool blogspot on teas, while searching for information regarding Caffe Ti-Amo. I find it fascinating to find Pinoys like you, dedicating a blogspot all for the love of Camelia Sinensis! And to think that after all our exposure to Uncle Sam's coffee culture, we're just about the only non-tea drinking nation in Asia! Anyways, i'm also into teas! We actually distribute a brand of Ceylon Teas to some hotels, bars, restos & supermarkets here in the Metro. This might be a long-shot but anyways, we have a booth at Eastwood Mall's Weekend Gourmet Market, this coming Sat & Sun. (June 26 - 27) where all of our teas will be showcased. Just in case you can make it, kindly introduce yourselves to us, so we let you guys sample our home brewed Ceylon Iced Tea w/ Lemon free of charge! More power to Tea, Completely!!! Its me once again! Why not try doing a review on Chowking's "Nai-Cha" Milk Tea. I heard that they actually use real black tea leaves to make it, with matching tea jelly to add texture to the flavor! you can also make the same kind of tea using a tea kettle to prepare it.